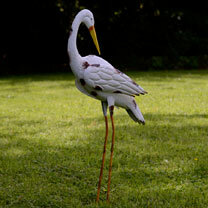 These 2 attractive metal storks are perfect for displaying on a patio or balcony and will add a touch of wildlife to your garden. 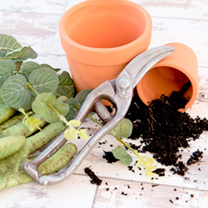 Prune your gift list with this perfect present ideal for amateur or professional garden enthusiasts. Looks exactly like real secateurs but is in fact dark chocolate!  73g. 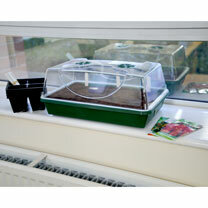 February is the best time to sow Chillies and Peppers. Our Sweet Pepper starter kit includes everything you need to get them off to a flying start. Just add water and a little bottom heat. With an outstanding 570-liter capacity the Norfolk Rockwood Waterproof Storage Box is one of the largest watertight outdoor storage boxes currently available. Despite its large size and functionality this product maintains its high level of quality and stunning good looks while the high quality resin ensures that it will never rot or decay.Features:High quality resinCreate stunning outdoor storage spaceWater-proof storageOpen and close piston for safetySpace for padlockFurniture colour: Dark Brown Wood EffectWith plenty of storage space for all your outdoor goods the Norfolk Rockwood Waterproof Storage Box is a hard wearing and water-proof storage option that will ensure that your outdoor goods are always close at hand while you are enjoying your garden or pool.Whether you are looking to store outdoor cushions garden equipment or outdoor toys for the kids this box has more than enough space and thanks to its water-tight design it is also perfect for storing animal and bird food. 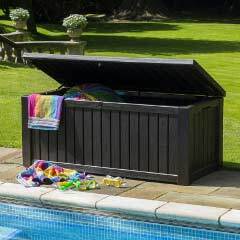 This storage unit is also ideal for storing pool and hot tub accessories close by the pool for easy access while out swimming. In addition to being able to store a huge amount of goodies this product doubles as a handy bench.This outdoor storage box features a space for a padlock (not included) so that you can safely leave things out in your garden without having to worry about them and as an added safety feature this product features an open and close piston that prevents trapped fingers.The durable and long-lasting resin is famous for its high quality and will never rot corrode or decay making this a low maintenance piece of outdoor furniture. Suitable for outdoor use.Dimensions: Rockwood Storage Box 570 Litre Capacity:External: W155 x D74 x H64cmInternal: W142 x D62 x H58cmWeight: 22kgThe Norfolk Rockwood Waterproof Storage Box is easily one of the best looking and most functional outdoor storage options available. We are all familiar with the classic bay tree lollipop shape standard, but how about a completely different colour option? The fabulous golden yellow leaves of Choisya ‘Sundance’ (or Mexican Orange Blossom as it is sometimes called due to their small white fragrant flowers in spring), glow bright golden yellow in spring and summer, yet remain neat and tidy too. 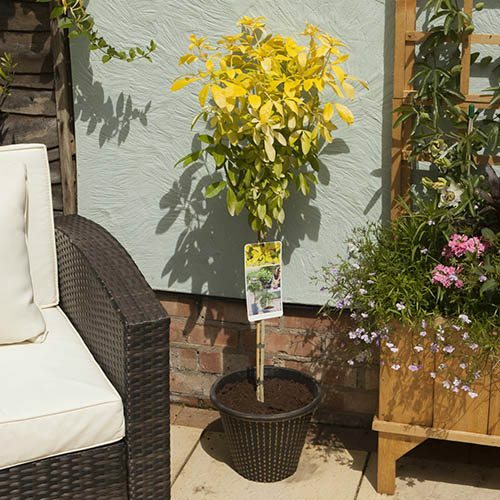 And they are ever-yellow too – they remain bright yellow all year, even in winter, so offer a real year round feature. Grown on a clear stem of about 50cm, these standard Choisya’s are quite unusual, and work really well as a low maintenance feature in pairs either side of a doorway or gate. 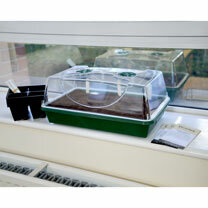 Ideally feed from 6-8 weeks up until 16 weeks or to finish. Feed on an ad lib basis. 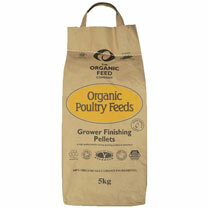 For birds that are to be kept as laying hens, introduce Organic Pellets gradually from 16 weeks. 5kg. Feel the sun on your face as you rest your head back on the pillow and relax on this reclining Greenfingers Tuscany Sun Lounger. It is perfect for the ultimate lazy summers day! The pillow has Velcro on the back making it easily removable while the lounger can fold down for storage. Manufactured from steel tube framing and the choice of black or cappuccino quick drying poly-textile fabric. UV resistantDimensions: L136 x W61 x H94cm Height of seat: 29cmLoad capacity: 100kgAvailable in either black or cream colour. 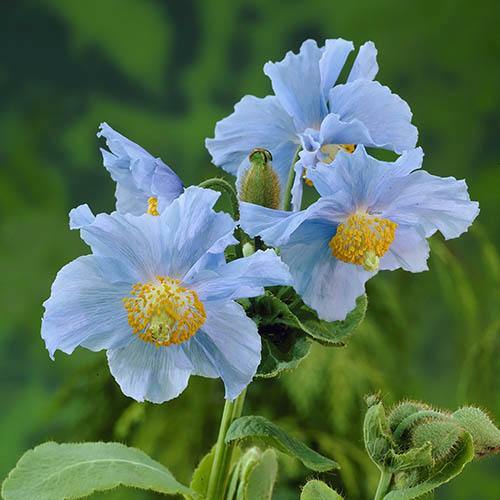 Himalayan Blue Poppies will produce striking bright blue, poppy-like flowers in early summer each year, each one with a gorgeous contrasting golden centre. These little beauties will add stunning impact and a definite wow factor to your flower beds and borders this summer! As they are perennial plants they will die back in autumn and come back each year with bigger better displays for many years. Highly unusual and still very rare you’re unlikely to find them in garden centres, so grab your chance to get something your friends wont have at a great price! They’ve also been awarded the prestigious RHS Award of Garden Merit for their all-round garden performance.